Curious about how your career after service could be “Made in AmeriCorps“? Join AmeriCorps Alums today, Wednesday, May 29, 2013 from 12:00 PM – 1:00 PM EDT for the AmeriCorps Alums Career Panel! Register now to join us on the call! The webinar will provide unique perspectives from three alumni speakers on how they leveraged AmeriCorps as part of their career. Each speaker comes from different sectors, helping to provide insight into multiple career-types available to Alums after service. The webinar will be recorded and will be available for playback after the call concludes on our Archives section of our website. Read below to meet our panelists presenting on the call. As the International Education Analyst for ILC Africa, a small international development consulting firm based in Ghana, West Africa, Leah Hoffman works to assist West African high school and college students in securing collegiate admissions opportunities to the United States. As part of the undergraduate and graduate admissions program, Leah also teaches exam preparation courses for students, and collaborates with other West Africa-based international education organizations and schools in the region to develop a deeper understanding of education and admissions best practices. Prior to her experience in West Africa, Leah worked for New York Cares, managing non-profit partnerships and an AmeriCorps technology program in the New York City area. A proud WIsconsinite, Leah graduated with a degree in Urban Studies from the University of Wisconsin-Milwaukee in 2009, is a proud alumnus of the AmeriCorps program City Year 2010 and 2011, and served on the City Year New York Alumni Board (2011-2012). After graduating from Colby College, Anna Capezzera served twice with AmeriCorps*NCCC at the Charleston campus, as a corps member on Blue 5/Class X and the team leader of Red 5/Class XIII. Over the past decade, she has been an EMT, a freelance writer and editor, and an audio description writer/producer. 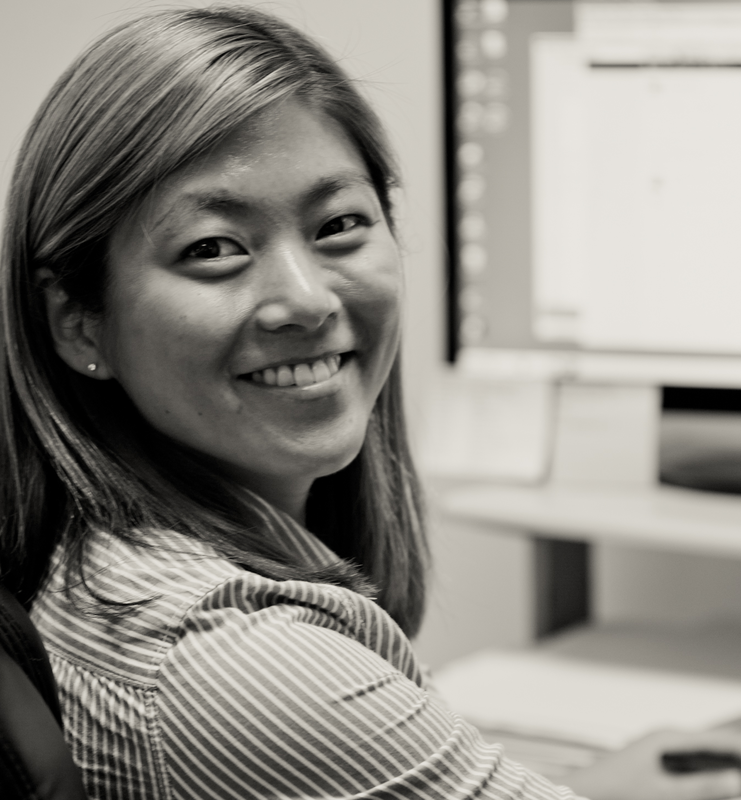 In 2012, Anna co-founded Hollywood Access Services, a company that specializes in improving and increasing accessibility to visual entertainment for blind and low vision audiences. Read more about her AmeriCorps Alums story from this guest blog post on April 12, 2013. 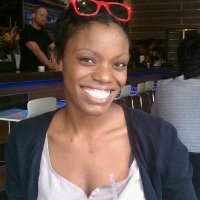 An alumnus of Bridgewater State University, Susan Paul completed two years of service Boston Community HealthCorps, ’05-‘06 at Children’s Hospital Boston’s Martha Eliot Health Center and AmeriCorps*VISTA at San Diego District Attorney ‘Office ’09-‘10. 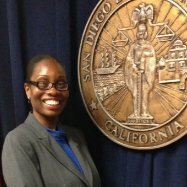 She is currently the Communications & Community Programs Specialist for the San Diego District Attorney. 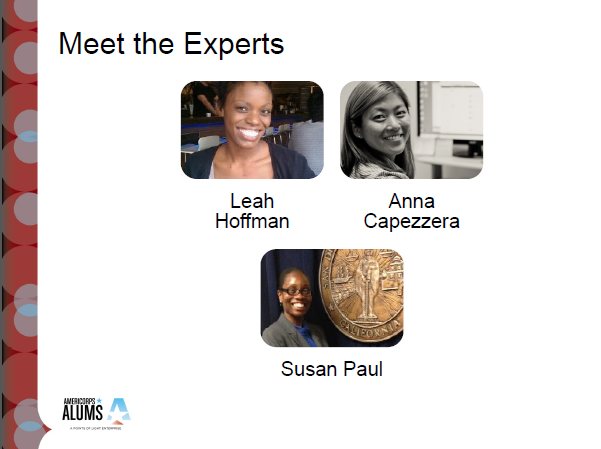 [UPDATE 5/31/13] – Listen here to the recorded AmeriCorps Alums Career Panel Webinar.